Looks like I goofed up the github URL, so you're not going to see updates to the SNMP package unless you uninstall and reinstall. Sorry about that. FYI the only update in a while has been the fix for this problem. 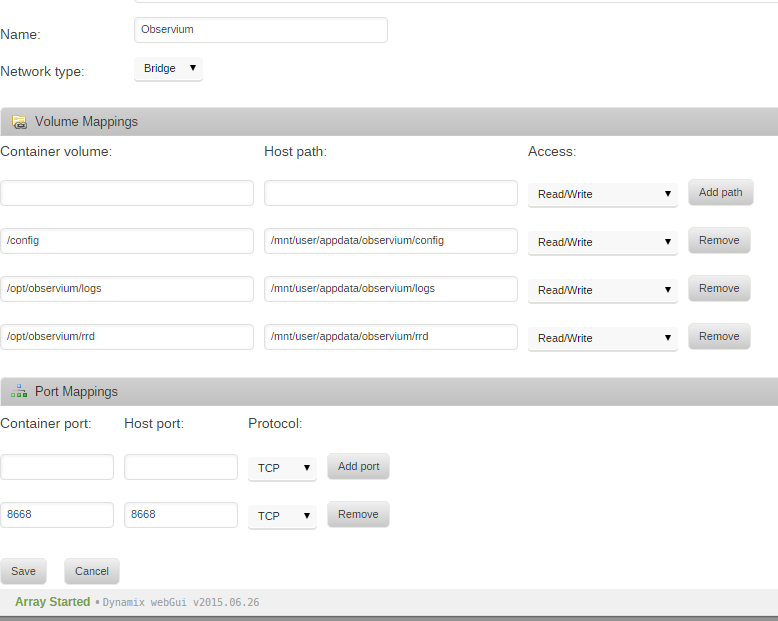 Not sure if any of you will be able to help me, i can't get my head around observium, do i install it as bridge or host? is there any chance to add the drive temperatures to the MIBs the same way, you added the unraid drives? pretty sure everything else was blank/default. .. and while thinking about it: It would be nice to add the up/down state also to MIBs - that would give a great historical view on the spinning status of the drives! So snmpd.conf has to be extended by Agent functionality. exec [MIBOID] NAME PROG ARGS"
sh   [MIBOID] NAME PROG ARGS"
extend [MIBOID] NAME PROG ARGS"
extendfix [MIBOID] NAME PROG ARGS"
So if it is possible to get the information from emhttp via perl, it should be doable, iiuc? So it shouldn't be too difficult to use the respective parts from e.g. dynamix temp plugin (shell script), that is already determining temperature and disk status and output to a MIB. hdparm tells us, if the drive is in standby - smartctrl tells us the drive's temp. Question: I had a look into myMain.awk code of unmenu - it also uses smartctl to gather disk temp - and also gets them when disk is spun down - iirc, this is not possible with all drives/manufacturers, but it would be nice to get temps continously :-). When I get some time I'll take a look. Edit: Catching up on your other posts, I see that you may have found a better method that doesn't require rebuilding snmp. Thanks! Try using the IP address instead? You have to provide hostname which can be resolved to IP address. Resolution can happen e.g in your home router. In other words Observium only accepts hostnames. I gave up. Thanks for looking. Is there a way to test to make sure it is installed and working right? Having trouble trying to connect to observium. On another computer I tried to telnet to tower on port 161 which should at least connect if the port is open but doesn't work. On installation it does a self-test. Uninstall and reinstall to double-check it. Installed and feeding data to MRTG (old school, I know). Now to see what OIDs are good to watch! I've dropped the log level to "warning", and it so far hasn't put anything in my log. That should help with disk usage. Unfortunately drive temps are like the only thing Observium doesn't handle automatically. This thread might give you some idea of how to set it up. Doh. I forgot to install the helper script. Try version 2015.08.25. Hopefully this time the test output will show drive temps. I'm not 100% sure the temps will be picked up by your monitor. If you can find any docs on what the monitor queries for, I can see about supporting it. Hmm... On the plus side, this plug-in architecture works great! unRAID can see the temps - as shown in the screen shot below. To complicate things - My unRAID system is a virtual guest on VMware ESXi. The disk controller is "passed through" to the VM, and is dedicated to the VM, as are all the attached disks. Can you log into your server and run the following? Hi, I just did and it lists all my hard drives with a colon but no temperatures at all. Drives are all spun down though. Hope this helps, Alex. PS: I'm on the latest version of the plugin. Yeah, I can't always get temps if the disks are spun down. Well, is the config file updated properly? What happens if you run it manually?